What Is The Biblical View Of Magic? 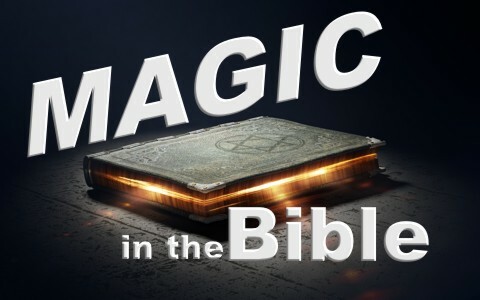 What is the biblical view of magic? Is it sin? Should we distance ourselves from it? The definition of magic varies widely, depending upon whom you ask. Magic may include the use of symbols, rituals, actions, chants, gestures, and language that somehow contain power to perform certain functions. Magic still plays an important spiritual, religious, and medicinal role in many cultures around the world today. It may involve the art of producing illusions as entertainment, using the use of sleight of the hand, deceptive devices, or conjuring some result up for an audience to see. It is a desired effect or result through the use of incantation or various other techniques that presumably assures human control of supernatural agencies or the forces of nature to be under the control of those who perform it (magicians). Many argue that magic and miracles claim to be the same thing and that is that they are the intervention or suspension of the natural laws of science to achieve something that would otherwise be impossible, but clearly, magic and miracles are not even close to the same thing because of their source. A magician can pull a rabbit out of their hat but only God can bring a dead rabbit back to life. Magic has its limitations but miracles do not. Magic always give glory to the magician; miracles give glory to God. Even those in the early church that had God perform miracles through them gave God the glory. The magician takes glory for himself and that’s bad because God will not share His glory with anyone else (Isaiah 42:8; 48:11). The greatest difference between magic and miracles is their source; one can be human or even from wicked spirits, the other is always from God. When God sent Moses and Aaron to bring His people out of Egypt, “Aaron cast down his staff before Pharaoh and his servants, and it became a serpent. Then Pharaoh summoned the wise men and the sorcerers, and they, the magicians of Egypt, also did the same by their secret arts. For each man cast down his staff, and they became serpents. But Aaron’s staff swallowed up their staffs” (Ex 7:10b-12). Apparently, Pharaoh had his own magicians but they are no match for God. What was the source of Pharaoh’s magician’s magic? If it is not from God, the only other source is from Satan and his demons. Amazingly, when God’s plagues came, “the magicians did the same by their secret arts and made frogs come up on the land of Egypt” (Ex 8:7) so they must have had considerable access to the dark forces of evil. There is no other explanation because later “the magicians tried by their secret arts to produce gnats, but they could not. So there were gnats on man and beast” (Ex 8:18) and even “the magicians said to Pharaoh, ‘This is the finger of God.’ But Pharaoh’s heart was hardened, and he would not listen to them, as the Lord had said” (Ex 8:19) as “the magicians could not stand before Moses because of the boils, for the boils came upon the magicians and upon all the Egyptians” (Ex 9:11). It doesn’t matter what we think of magic or the source as much as what God thinks; that’s what is important and God says through Ezekiel the Prophet in a foreboding way “Woe to the women who sew magic bands upon all wrists, and make veils for the heads of persons of every stature, in the hunt for souls! Will you hunt down souls belonging to my people and keep your own souls alive” (Ezk 13:18). The Hebrew word for “woe” is “howy” and this is not a “woe is me” but a “judgment” or “condemnation” so it’s not like a rebuke but a judgment that’s already been determined! This explains God’s statement that “I am against your magic bands with which you hunt the souls like birds, and I will tear them from your arms, and I will let the souls whom you hunt go free, the souls like birds” (Ezk 13:20). Nothing has changed by the time the New Testament period comes because God doesn’t change (Mal 3:6) and doesn’t change His mind about what He thinks about magic as we read about the experience with Simon the Magician in the Book of Acts “there was a man named Simon, who had previously practiced magic in the city and amazed the people of Samaria, saying that he himself was somebody great. They all paid attention to him, from the least to the greatest, saying, “This man is the power of God that is called Great” (Act 8:9-10). Everyone “paid attention to him because for a long time he had amazed them with his magic. But when they believed Philip as he preached good news about the kingdom of God and the name of Jesus Christ, they were baptized, both men and women. Even Simon himself believed, and after being baptized he continued with Philip. And seeing signs and great miracles performed, he was amazed” (Acts 8:11-13). After this, “when Simon saw that the Spirit was given through the laying on of the apostles’ hands, he offered them money, saying, “Give me this power also, so that anyone on whom I lay my hands may receive the Holy Spirit.” But Peter said to him, ‘May your silver perish with you, because you thought you could obtain the gift of God with money! You have neither part nor lot in this matter, for your heart is not right before God. Repent, therefore, of this wickedness of yours, and pray to the Lord that, if possible, the intent of your heart may be forgiven you. For I see that you are in the gall of bitterness and in the bond of iniquity’” (Acts 8:18-23). With this, “Simon answered, ‘Pray for me to the Lord, that nothing of what you have said may come upon me’” (Acts 8:24). We don’t know what came to be with Simon. We don’t hear about him anymore but the point is clear; magic was sin to God and brought the threat of His judgment upon him and all who do such things. We can tell this because when Paul and his companions encountered “Elymas the magician (for that is the meaning of his name) opposed them, seeking to turn the proconsul away from the faith. But Saul, who was also called Paul, filled with the Holy Spirit, looked intently at him and said, ‘You son of the devil, you enemy of all righteousness, full of all deceit and villainy, will you not stop making crooked the straight paths of the Lord? And now, behold, the hand of the Lord is upon you, and you will be blind and unable to see the sun for a time.’ Immediately mist and darkness fell upon him, and he went about seeking people to lead him by the hand. Then the proconsul believed, when he saw what had occurred, for he was astonished at the teaching of the Lord” (Acts 13:8-12). Acts 19 is a great picture of repentance because “many of those who were now believers came, confessing and divulging their practices. And a number of those who had practiced magic arts brought their books together and burned them in the sight of all. And they counted the value of them and found it came to fifty thousand pieces of silver. So the word of the Lord continued to increase and prevail mightily” (Acts 19:18-20). The fate of all magicians, sometimes called sorcerers, is already predetermined by God unless they repent for it is written that “the cowardly, the faithless, the detestable, as for murderers, the sexually immoral, sorcerers, idolaters, and all liars, their portion will be in the lake that burns with fire and sulfur, which is the second death” (Rev 21:8) and outside of the kingdom you will find “sorcerers and the sexually immoral and murderers and idolaters, and everyone who loves and practices falsehood” (Rev 22:15), clearly meaning that no one who practices magic without repenting of it will not be in the kingdom but instead, “the lake that burns with fire and sulfur, which is the second death.” That should give us sufficient cause to avoid any kind of magic and those who do it. Related reading: What Does the Bible Say About Sorcery? As an amateur card magician, I am wondering if doing illusions for fun is categorized as a sin? I know of many Christian magicians who do “magic” for pure entertainment. Almost showing their fast hand skills for slight of hand. Thank you sir. I think you bring up an excellent point and perhaps, I would hope, they would mention that they are only “slight of the hand” things and that there is no actual magic and that their tricks are using physical means and not the forces of darkness. Hello Kane. It is impossible to glorify God and not do as He commands and He says to avoid these things. From my research, Pyrokinesis is the purported psychic ability allowing a person to create and control fire with the mind. There is no conclusive evidence that pyrokinesis is a real phenomenon. Alleged cases are hoaxes, the result of trickery” so this is as evil as it gets. You cannot justify pyrokinesis in any way at all. What truly is the destestible magic? As in is the type of magic hoodeeny did where we all knew it was an illusion. Is that the type of magic God is condemning? Or is there another type of magic? If so what is the line between just illusion like hoodeeny performed and magic that the Egyptian magicians used? Hello Josh and thank you for your question. Those things done by the Egyptians were likely a slight of the hand, or worse, they were empowered by Satan, but what is “destestible magic?” I have not heard of that. There is only one magic that I know of, but God works miracles…the Devil can use deception. What the line is between illusion and “hoodeeny,” I don’t know my friend. I do know that all those who practice such things will not be in the kingdom. Previous post: How Did The Bible Get Its Name? What Does The Word Bible Mean? Next post: I Am Married To An Atheist and Am Now A Christian, What Should I Do?